ASC's December production of "Little Match Girl"
Kicking off the season on the ASC main stage is A Streetcar Named Desire, the classic American play written by Tennessee Williams, being directed by Dr. Paul Newman. When asked about his concept for the show, Newman said, “This play is all about privacy – or the lack thereof.” In a culture that has become dominated by social media platforms such as Facebook and Twitter, Newman has managed to capture a strong element of the play that still remains relevant to current audiences. The show opens September 23 and runs through October 2. Opening on October 24 and running through the 29th will be this semester’s student directed production, “Tough Love/Luck”. Grabbing the reins for this show will be seniors Kaitlyn Perham and Abby Sandoval. Perham has chosen to direct the romantic comedy Will You Please Shut Up by Dan O’Brien, a play which follows the meeting of two former lovers as we trace through their past and unravel the source of their bitter loathing. On the other end of the spectrum is Abby Sandoval, who will be directing The Lottery, a dramatic piece that takes place in a small town on an unusual day. Everyone is acting strangely, children collect rocks, and all the while there is talk of a mysterious ritual to be taking place. The creepy atmosphere and chilling conclusion are a prefect compliment to the Halloween weekend. Following the student directed show is a special treat from professor Jenna Neilsen. Under the direction of Dr. Newman, professor Neilsen will be performing a one-woman show titled My Name is Rachel Corrie. “I chose this show because of the connection I felt with the title character. I wanted to challenge myself,” said Neilsen. Based on the real life experience of Rachel Corrie, the show will run for two nights only – November 12 and 13 – and is sure to be a unique experience for all who come to watch. 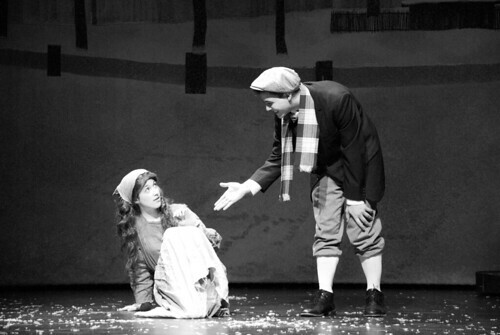 Closing out this semester’s lineup of theatre productions is A Christmas Carol, the classic Christmas tale based on the Charles Dickens novella of the same name. This is not the first time Dickens’ tale has graced the ASC stage, and for this particular production, director John Taylor has spent a considerable amount of time crafting his own script while remaining faithful to the original story. Dr. Taylor, who’s “brilliance can not be contained to the stage,” promises to bring this classical story to life in a grandiose fashion perfect for the whole family. The show opens on the ASC main stage the first weekend of December. With a strong lineup of shows and variety to spare, this semester’s theatre season is sure to have something for everyone. For ticket information, call 587-TIXX (587-8499) or stop by the box office located in the theatre building.